With Tour Peru (http://www.tourperu.com.pe/), we took the apparently “dangerous” bus trip into Bolivia. It all worked out just fine: our journey from Cusco to Puno was overnight – and having booked the cama seats, we settled into oversized, leather chairs that turned into comfortable beds (although the road was rather bumpy; a great sleep tool for some!). 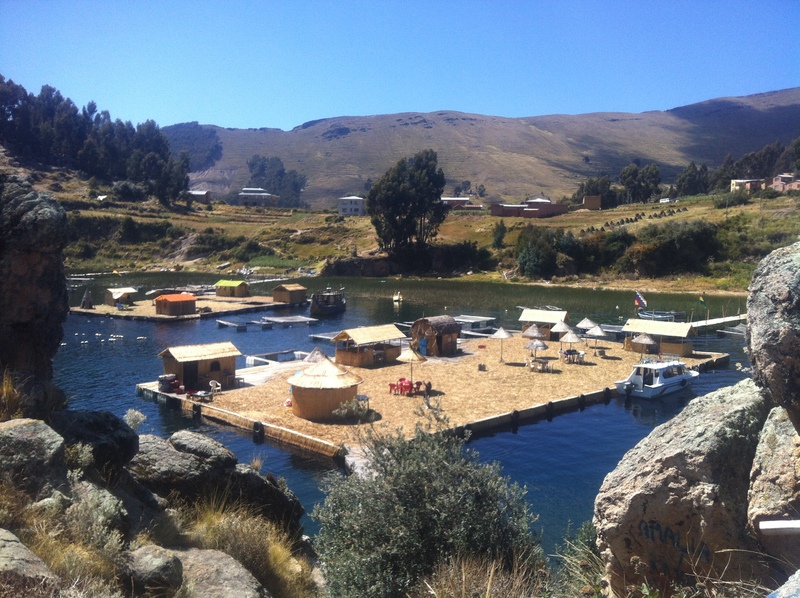 From Puno, we took another bus and drove to Yunguyo, where we crossed the border into yet again, another fabulous country. As Canadians, we are lucky that good relations exist and we do not have to pay hefty entrance fees (like e.g. our American counterparts who pay $135.00 US per person to enter Bolivia). However, the border process is still an interesting one. First, we needed to get exit stamps at the Peruvian side (we couldn’t find the white exit ticket from my passport so that involved more bureaucracy; copying passport pages, paying extra fees etc.). Then we lined up for two different Bolivian state offices to get our entrance documentation. Once completed, we walked across state lines and got back into the bus (with some cheers as we were the last ones!) for our final leg into Copacabana. 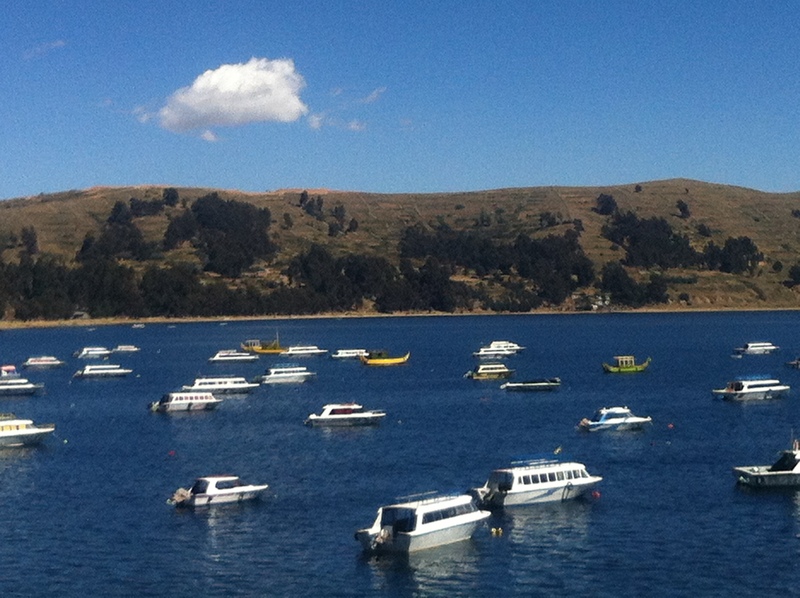 Copacabana is a delightful, small town on Lago (lake) Titicaca. 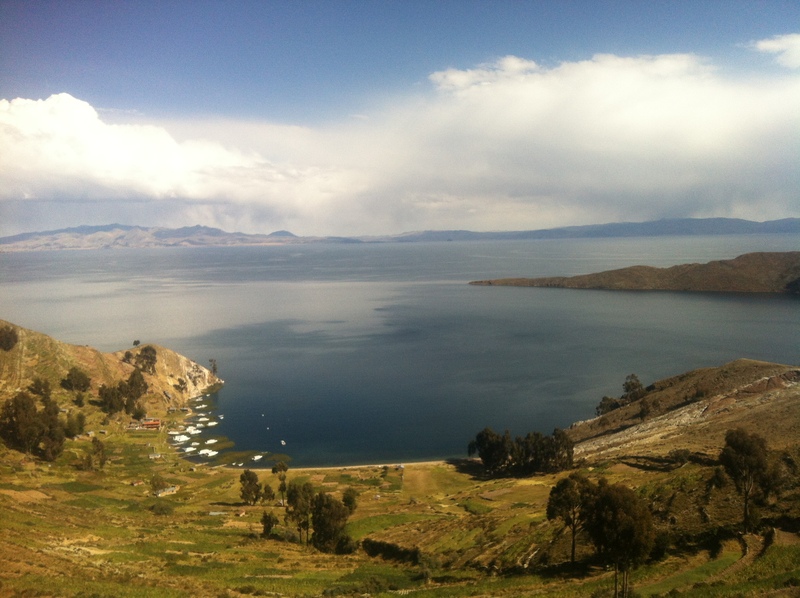 The first thing you’ll notice driving into town is this breathtaking lake (apparently the largest freshwater lake in South America and the highest of the world’s large lakes at 3,810 metres or 12,507 feet above sea level). We all quickly realized how much we missed WATER. The sight of this stunning blue body of agua, overshadowed by rays of sunshine put our bodies at ease and gave smiles to our faces. We smiled even more when we saw what our accommodations were going to be like for the next 3 nights. 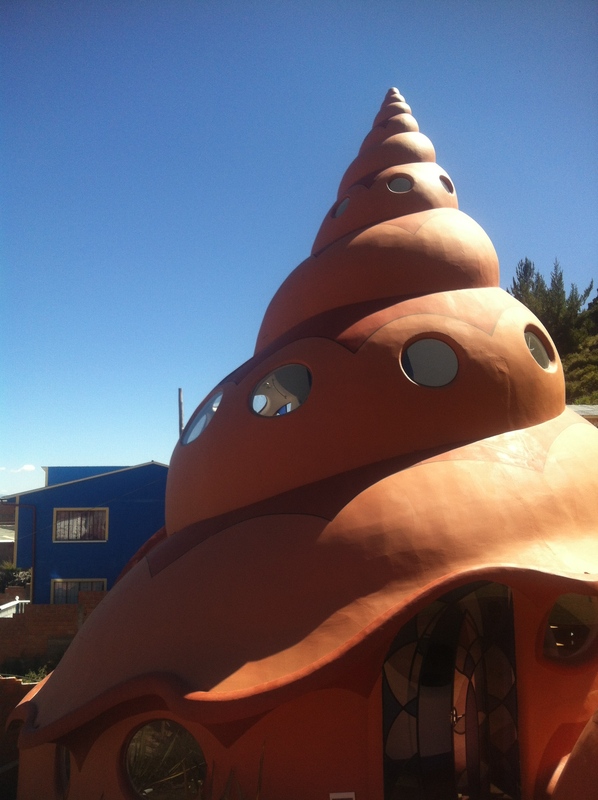 Our apartment was a 2 level deluxe house, shaped in the form of huge snail shell. The boys were thrilled! 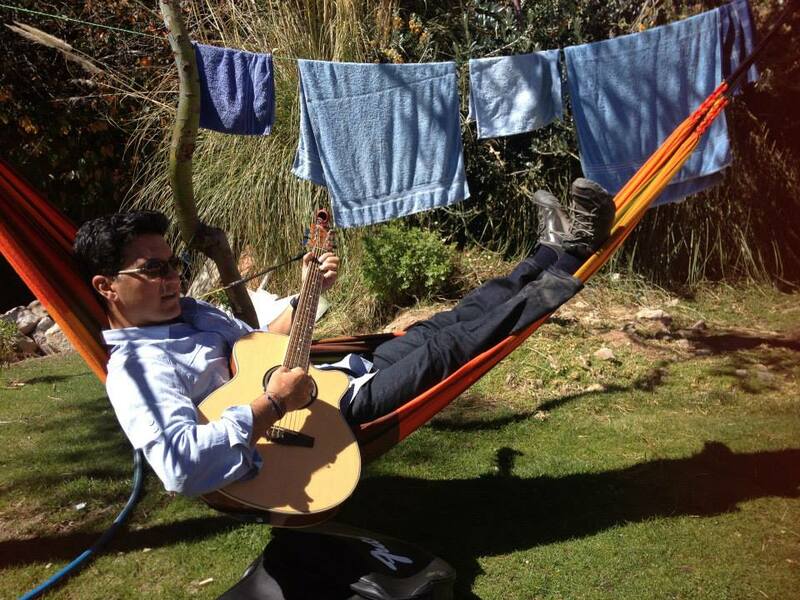 Moreover, two free-roaming llamas and colourful hammocks in our garden and in-room fireplace made it the coolest place we stayed in so far. 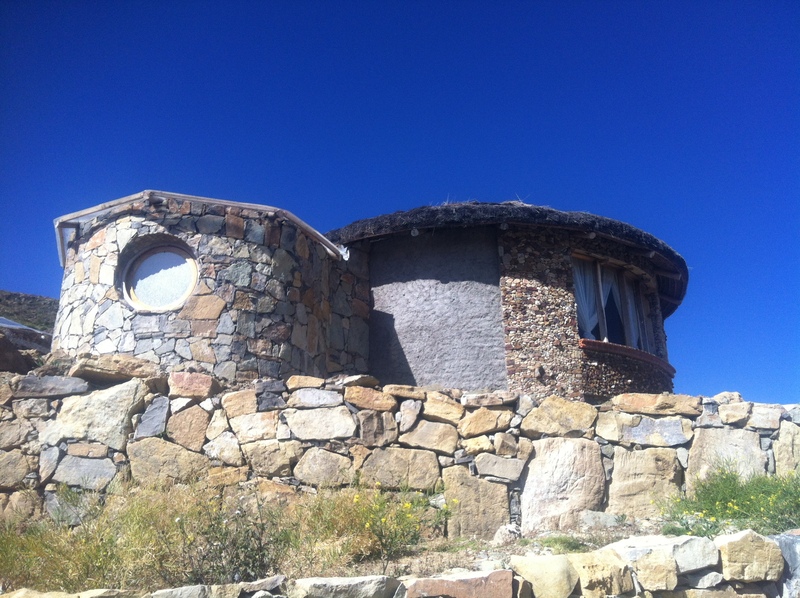 Our “snail house” was located high up on a hill – and had many, small circular windows that gave fabulous views over the lake and nightly spectacle of stars. Hostal Las Olas (http://hostallasolas.com) was the place to be in town and honestly, we had the best hideaway. What a treat! After a good coffee at El Condor & The Eagle Cafe, we set off to explore the town. We noticed right away that the merchants in Bolivia are much less commercial (“pushy”), then their Peruvian counterparts; we could easily browse without being bombarded with selling tactics. It was a refreshing change and speaks to the less-developed and down-to-earth nature of this country. 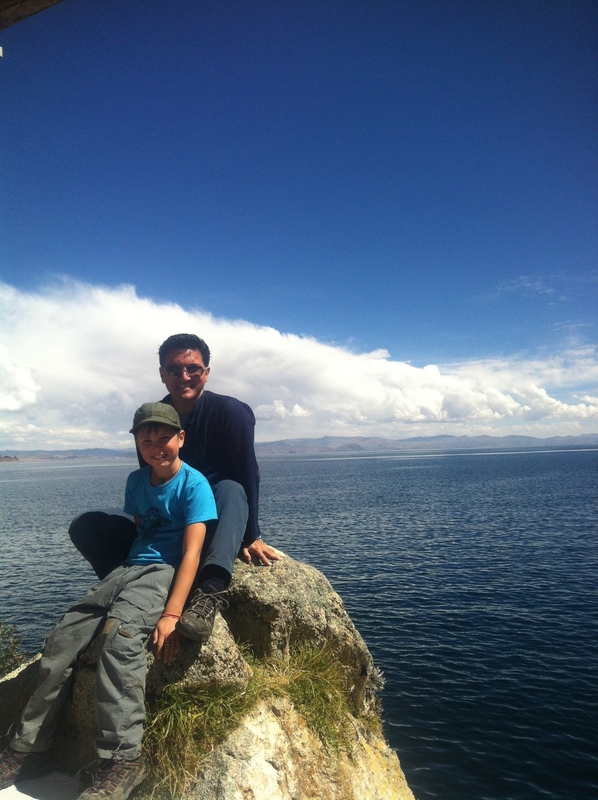 When we walked towards the Lake, we met a nice American-Bolivian family (the mother Sonia had left the United States to return to her roots in Bolivia after her divorce. Her daughter Sylvia who still lived in America was visiting her mom & new husband). 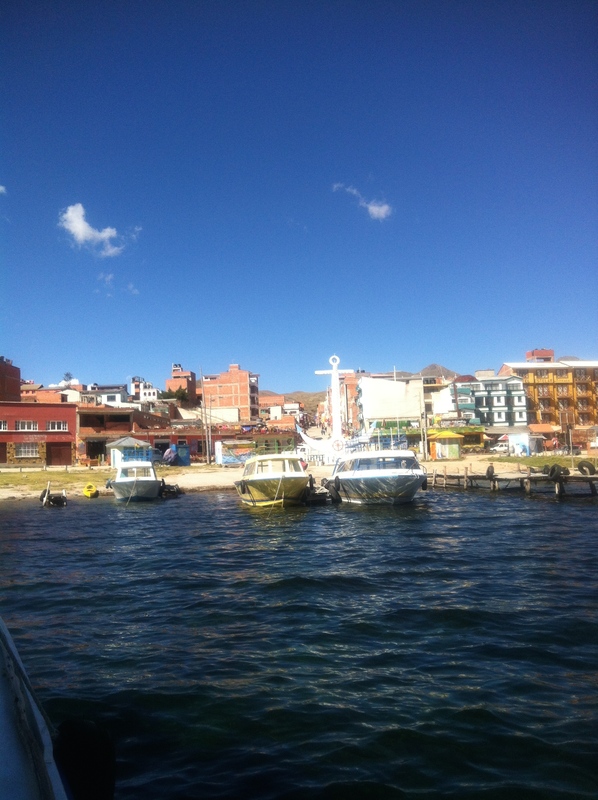 Together with the three of them, we took a boat tour on Lake Titicaca to one of the floating islands (that the area is so well-known for). The islets are made of reeds, which grow in the lake. The dense roots that these plants develop and interweave, form a natural layer called Khili (about one to two metres thick) that support the islands. They are anchored with ropes attached to sticks driven into the bottom of the lake. The reeds at the bottom of the islands rot away fairly quickly, so new reeds are added to the top constantly, about every three months (or more in the rainy season). These islands are constructed so smartly and apparently last about thirty years. Although we carefully stepped onto the reed island (the reeds break more and more as they are walked upon), we still sank about 3 inches and had to stabilize ourselves. Once settled, we were invited to come and scoop our own “truita” (trout fish) out of one of the ponds (the trout fish was introduced into the Lake in 1940 from Canada). Five jumpy fish were caught, killed, filleted and cooked to perfection within 20 minutes. Freshness never tasted better – so delicious! After a nice meal and wonderful chat, we climbed a nearby rock to take in the stunning surroundings from above. 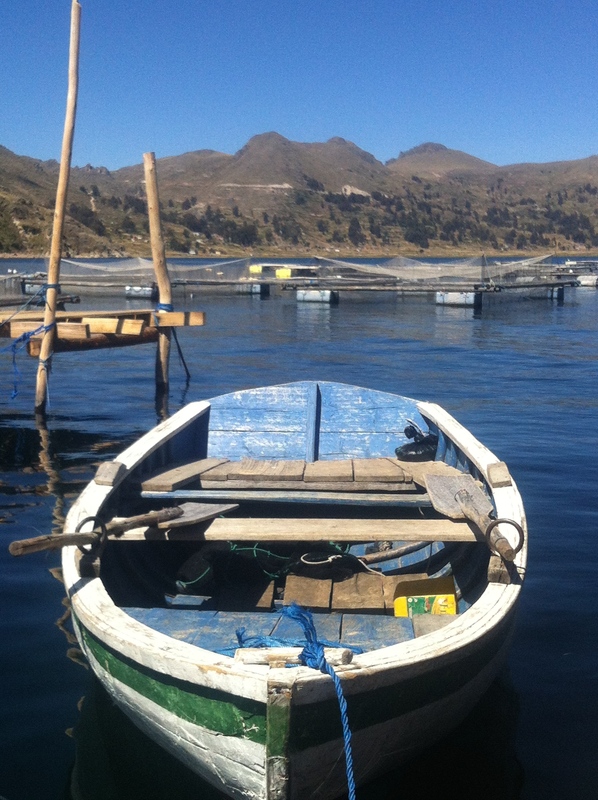 It was so nice to be on the water again and for me to take pictures of the colourful, local boats. We all thoroughly enjoyed our day on this famous lake. 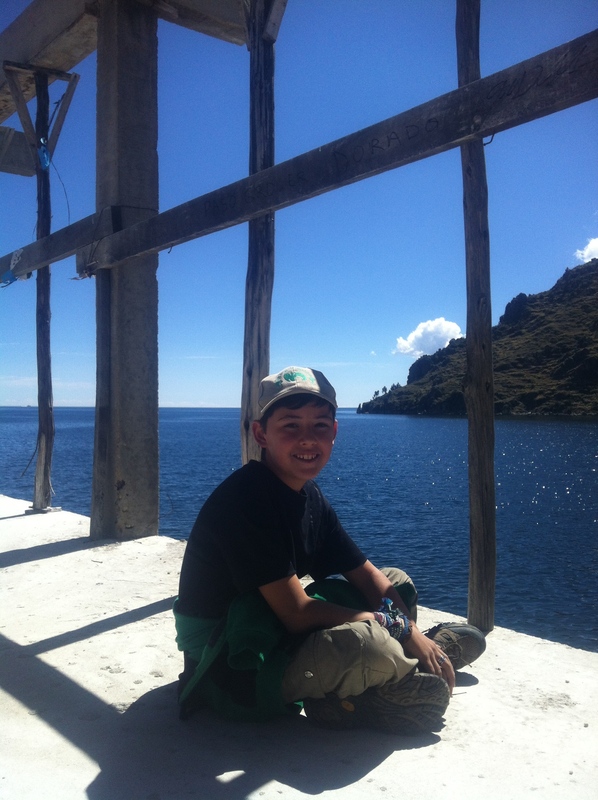 The water kept pulling us and the next day we set off on another boat tour – this time heading for Lake Titicaca’s largest island; Isla del Sol (Island of the Sun). This gorgeous, rocky, hilly island (with harsh terrain, no paved roads or motor vehicles) is located about 2 hours from Copacabana. Upon arrival, we were told that hiking from the North to the South part of the Island would take about 2.5 hours (3 hours max). 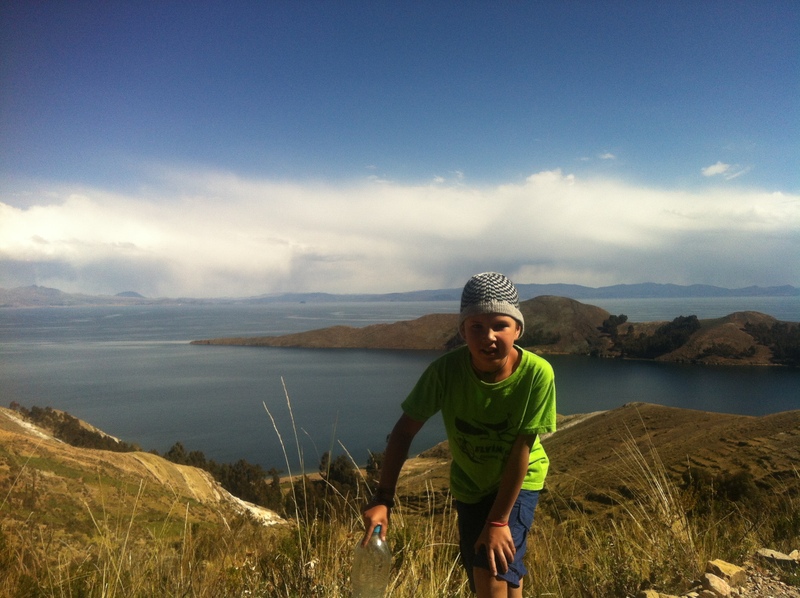 We enthusiastically took off walking, on a very picturesque mountain path – with stunning views of the lake all alongside us. Filou was so in his element; he must have climbed every steep slope he could find in the first couple of hours (we told him to conserve some energy but he wouldn’t hear of it)! We had about 4.5 hours to make it in time for our return boat so felt that we could easily accomplish this task (although Anthony was limping a bit as he had twisted his ankle in the morning and we had forgotten to take extra money out of the bank machine so we had some pressure to make it back to our boat in time, as we had no funds to stay the night). We admired the island’s many rolling hills that contain beautiful agricultural terraces. These terraces adapt the island’s steep and rocky terrain into agriculture – the main activity of the approximately 800 families living there. 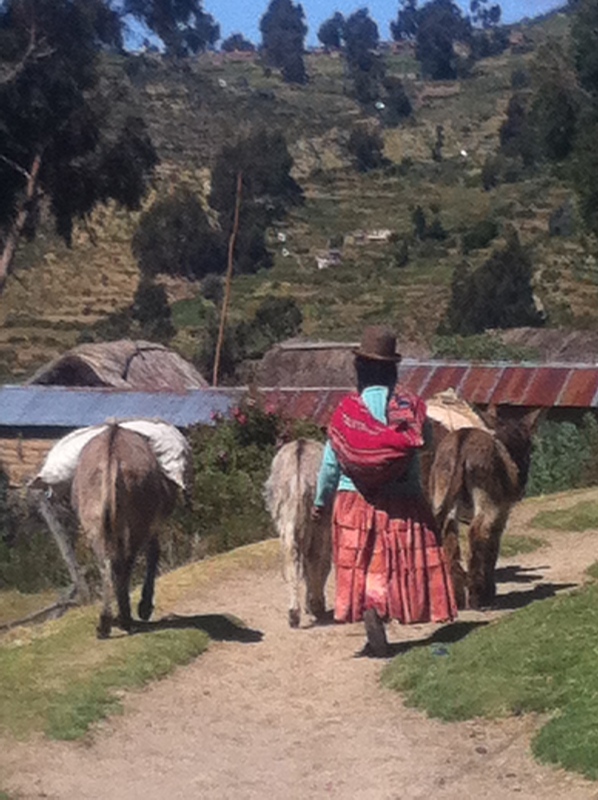 It was quite laughable that several much older, native ladies with their donkeys and extremely heavy back loads were quickly surpassing us while climbing the hills (and we thought we were somewhat in shape after globetrotting for 9 months)! But we enjoyed the spectacular views, had great family chats and were happy for the first 2-3 hours. It was then when we realized we were up for a major challenge. Crossing this island was not a small task at all – and it took us much longer then anticipated (it didn’t help that there was no signage at all which made us take a wrong turn and that Emile also started to limp as he had made a small slip down a rock). We were already envisioning what sleeping on the beach would be like…but the kids really wanted to get back to our beautiful “Snail House”. They tried to help and rushed out in front of us to make it in time for the boat. By this time Anthony’s foot was really hurting and although he was a trooper – he and I were exactly 5 minutes late for the boat. Do you think they would wait for us (even with pleas from the children)? NO! We couldn’t believe seeing the boat take off right in front of us. Thank goodness there was another boat that took us back ½ hour later…and although we accomplished one of our hardest hikes to date, the beautiful start to the day, had a bit of a nasty aftertaste. 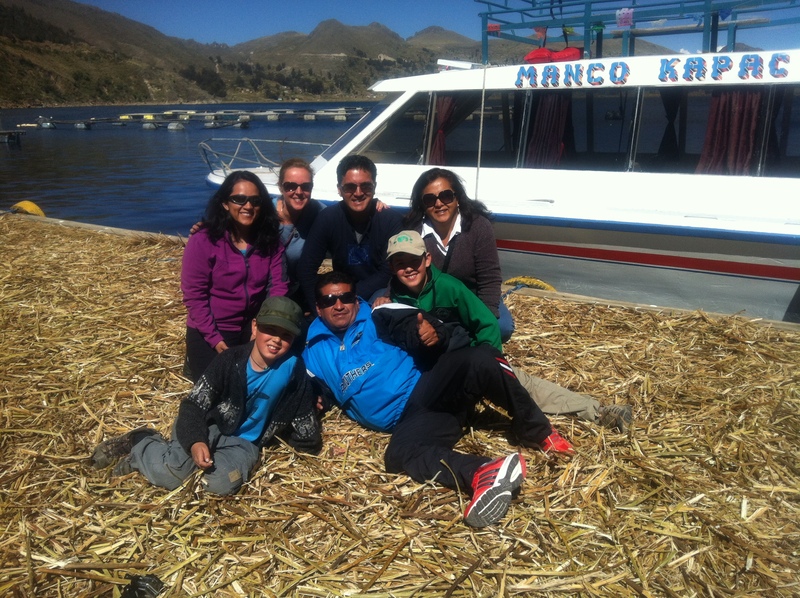 However, our last day in Copacabana was a good one again as we bumped into the lovely French family we had met in Cusco. We enjoyed a wonderful dinner out with Renaud, Severine and their 2 children; Mahé and Delpheé, as well as their friends from Germany. There were some great laughs all around and I was happy to have a drinking buddy for the night (and a French one no less!). Together Severine and I finished a nice bottle of red, which was the perfect ending to a wonderful stay in Copacabana! And so we left the city, after being chased down the many stairs of Hostal Las Olas by the llamas in our garden (we did not want to leave with some llama spit on us, so made a real bee-line not to cross them). One of the more determined llama’s chased another couple in so much haste, that it tripped over a water hose and almost landed on Anthony and our suitcases. What a story that would have been! 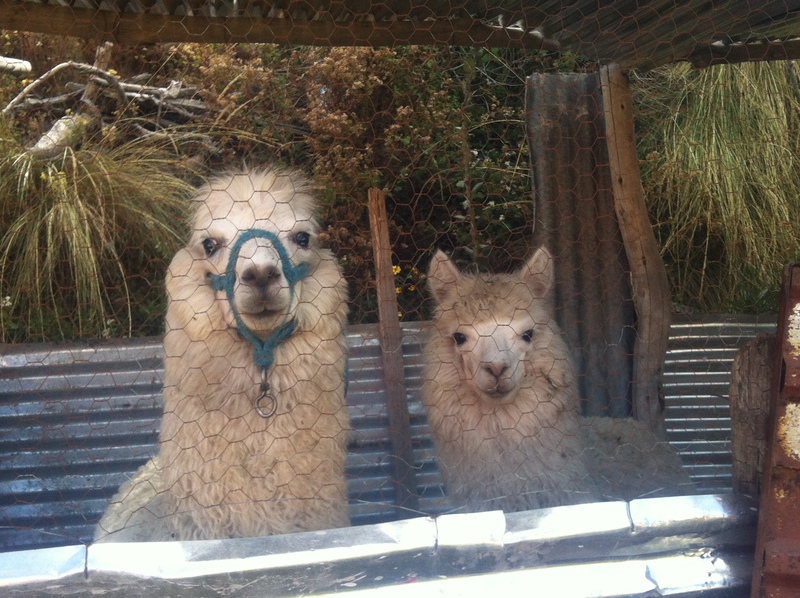 But full of gratitude for our fantastic stay at Las Olas and unharmed from llama attack we left to take a bus to La Paz. Driving into the city of La Paz was quite a unique experience, and one that quickly had us in awe. We were first welcomed by the imposing, triple peaked and snow-capped Illimani Mountain (6402 meters) and then by the city itself. 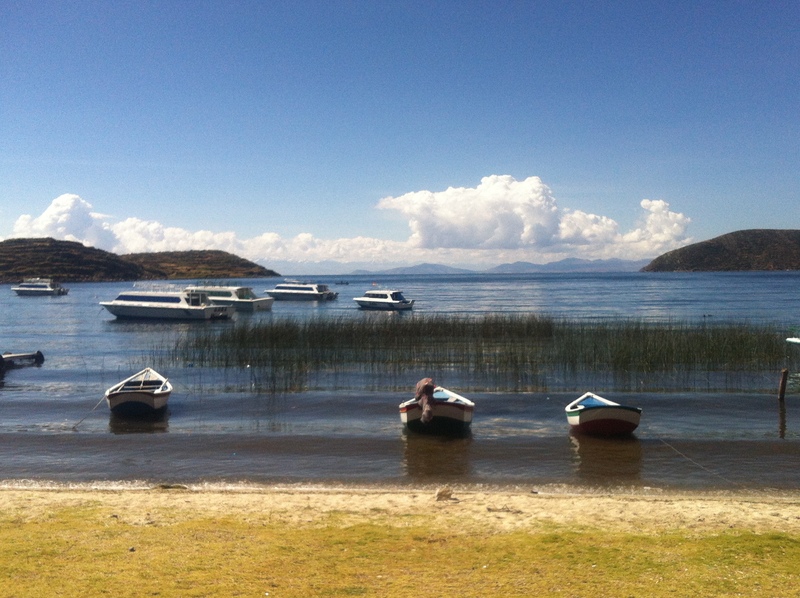 La Paz sits in a bowl surrounded by high mountains. As it grew, the city climbed the hills resulting in varying elevations of 3,200 to 4,100 meters. It was quite the sight! To learn about La Paz, we took the city’s FREE walking tour organized by Red Cap City Tours (http://www.redcapwalkingtours.com). We gathered at 11:00 am at Plaza San Pedro and were welcomed by two bright, well-informed, English speaking ladies that were ready to show us their vibrant town. They first taught us about the infamous San Pedro prison. This correctional facility is quite a unique one! There are no uniformed prison guards but elected inmate leaders enforce the laws of the community (with stabbings being commonplace!). Not only is the prison home to about 1,500 inmates, who are there mostly because of drug-related charges, but their spouses and children also live with them inside. What is so unique is that inmates have to buy or rent their accommodation and the sale of cocaine to visiting tourists helps them make money (how ironic as they were incarcerated for drug offences in the first place!). The prison has many living quarters and the wealthiest area “La Posta” provides inmates with private bathrooms, a kitchen, and even cable television or a hot tub! And there is a hospital inside the prison, as well as multiple churches and a hotel for visiting guests – how bizarre! Although no longer allowed, due to several accidents (who would think? ), the prison was an infamous tourist attraction until recently. Youngsters had the opportunity to pay a fee and go into the facility to visit with inmates for fun. The book Marching Powder by Rusty Young describes the experiences of the British inmate Thomas McFadden who became known for offering prison tours to tourists. 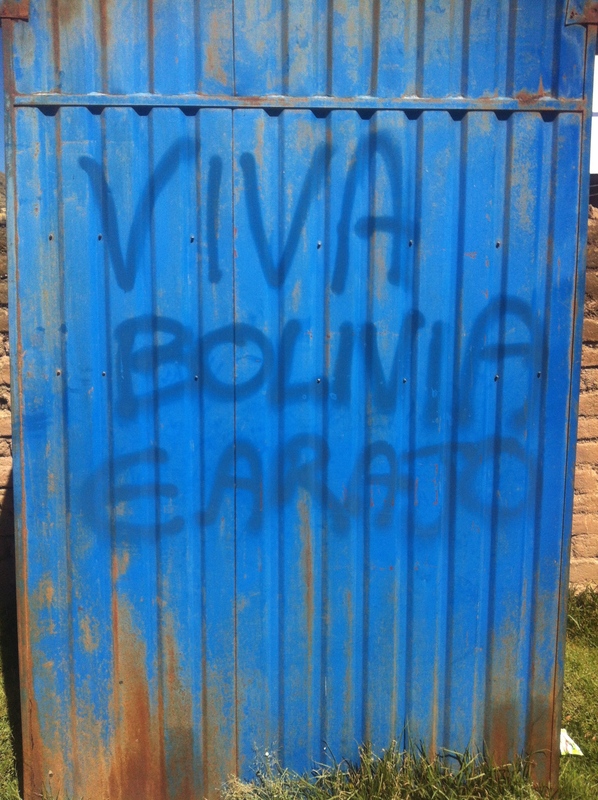 However, one should think before getting involved with drugs in Bolivia and ending up in this jail as most of the inmates are still waiting (15 years! ), to get their “fair” trial. From there we visited Rodriguez Market – a lively street market where the prominent item sold is the potato. In just Peru and Bolivia alone there are some 10,000 different varieties of potatoes, in colours ranging from green, to black, to pink and white (we saw a lots of chunos; white potatoes that are freeze-dried and can last up to 20-30 years). 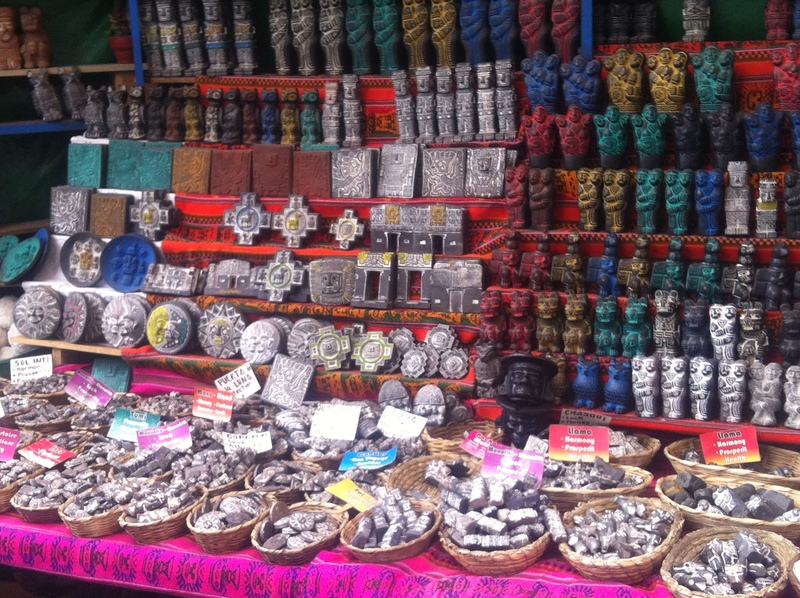 Another market of great interest in La Paz is the Witches Market. We were looking forward to passing through this neigbourhood with its colourful stalls and fascinating ingredients (herbs, parts of frogs and insects used for rituals as well as colourful soapstone figurines and other offerings). 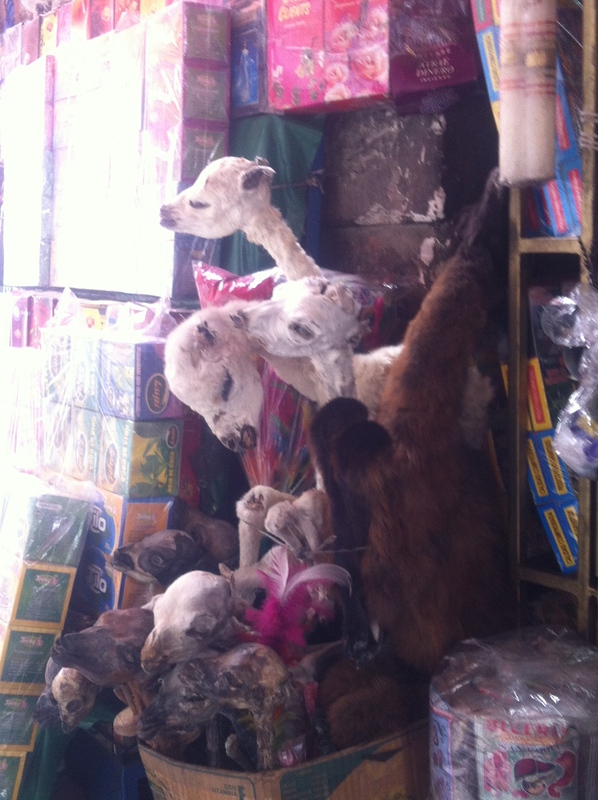 However, we were quickly a little disturbed as the most prominent product available here are dried llama fetuses (fairly large ones too!). The locals believe that a llama fetus needs to be buried in the foundation of their new house or business as an offering to Pachamama (Mother Earth). And the girls of Red Cap Tours told us the crazy story that sometimes street people are buried alive in the foundation of large buildings as a larger offering – we all just focused on believing this was a true urban myth as it was too crazy a story! Upon departing the area, we also saw a yatiri or witch doctor, all dressed in black with a dark hat. He was carrying his coca pouch (used to help him tell fortunes). But we are not superstitious and prefer to leave the spirits where they belong so passed on getting details about our future. Why jinx our awesome travelling fortune when we have great wealth and happiness already? We then saw the gorgeous cathedral at San Francisco Plaza and moved to Plaza Murillo where we learned about Bolivian politics and history. 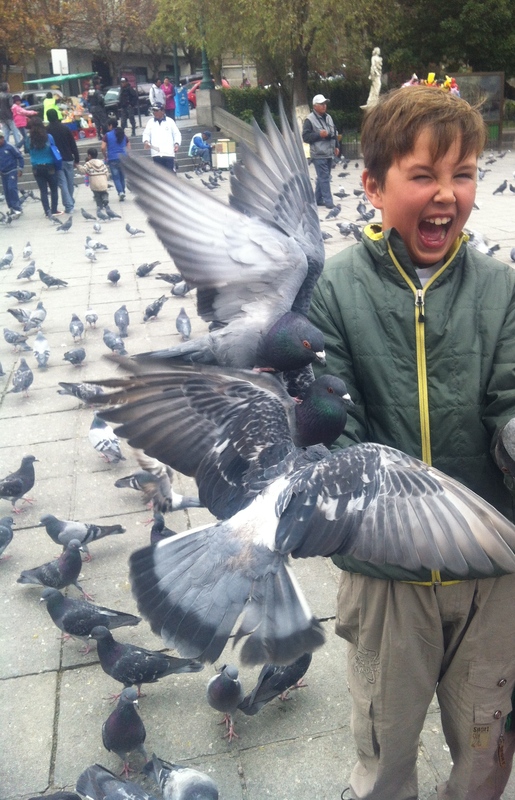 By this time the kids were losing a bit of interest and wanted to feed the pigeons in the plaza – what a delight; there was crazy laughter! All in all a fantastic tour… and from the top of Hotel Presidente (where we had an awesome view of the city), we said goodbye to our lovely tour guides. 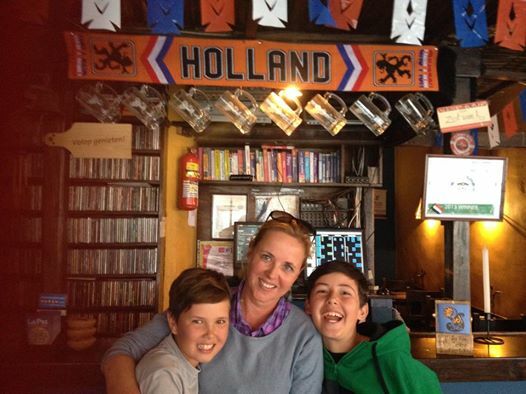 The next day was Mother’s Day, which we celebrated in style at Sol Y Luna, a wonderful Dutch café, decorated appropriately with Holland flags and orange banners. The best was the “Broodje Kroket Sate” (bread crumbed fried meat roll on bread): we all were in heaven. So delicious!I was in my element and happily hummed along with some great Dutch tunes (which I unfortunately didn’t recognize – must have been away from Holland too long) and after we played a fun game of billiards, it was time to wrap up the day. 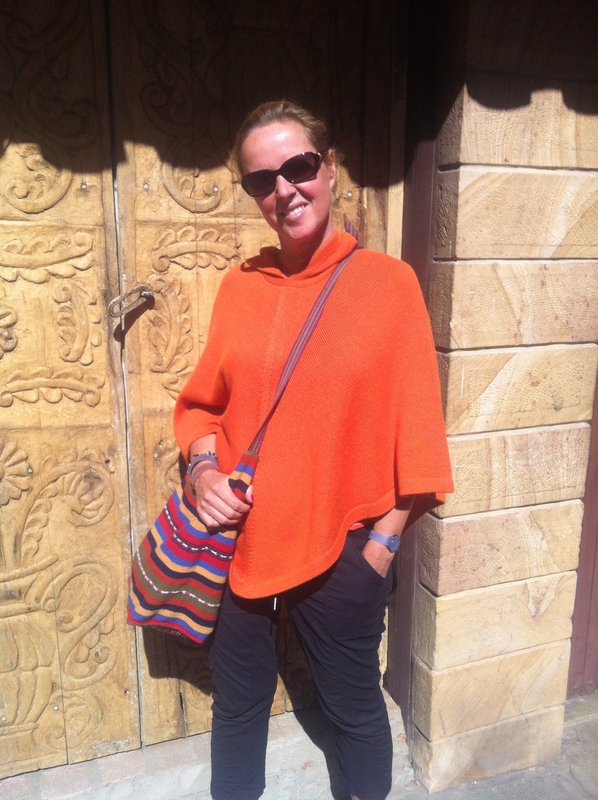 I received a beautiful orange llama poncho as my mother’s day gift and with that, our visit to this interesting city was complete. 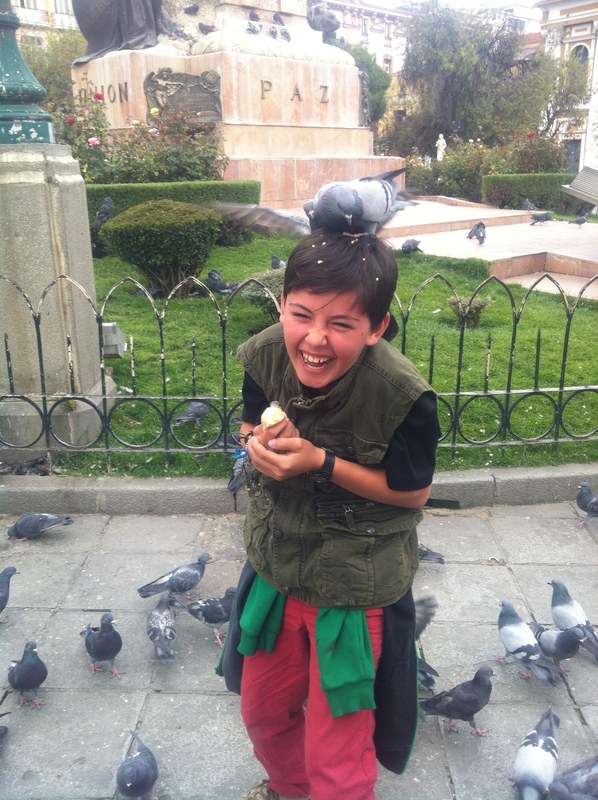 Next it is onto the Bolivian capital of Sucre!